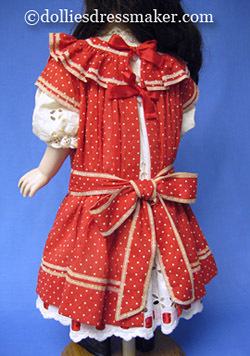 Often we categorize doll costuming as French detailed and German plain. To a great degree this is true, but if we doom plain, simple German costuming to dull, we short change our creativity and our dolls. The costume on a German reproduction Kestner belonging to Cindy Hernandez is anything but dull and is as authentic as any basic white batiste. 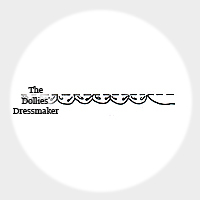 The eye of Cindy, who does business as The Dollies’ Dressmaker, is always on the lookout for distinctive vintage costumes that spark her creativity for replication. In this blue ribbon winner Cindy drew from two photos–one for the outer costume and one for the chemise–to create a sweet and innocent look for her Kestner. Each component of the costume is authentic to 1890-1910 and she has used all vintage fabrics and trims. The apron dress was original to an A & M 390 from about 1910, but such styles were very common in the 1890s as well. 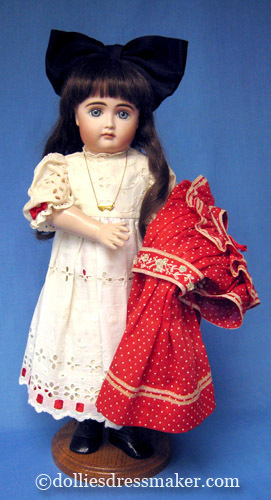 The chemise was original to a Kestner 171, known to be from 1910 or later since they were offered for sale in the January 1910 issue of Playthings. Keep in mind that styles overlapped as much as five years so it is difficult to pinpoint a costume with complete accuracy. Kestner made dolls from 1805-1925. This presentation is a reproduction of a Kestner 14 (Seeley mold “Miranda”) by Jack Merkel for costumer, Cindy Hernandez. 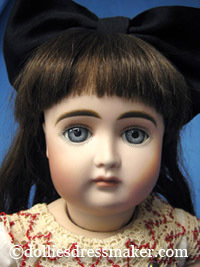 The doll was given a dark wig in order to look similar to her owner and was named “Jacqueline” to honor her maker. To help develop the skill for constructing your own extra-special costumes, study the following detailed description of how each piece was constructed. Both chemise and drawers are made of a gauzy muslin-type cotton. 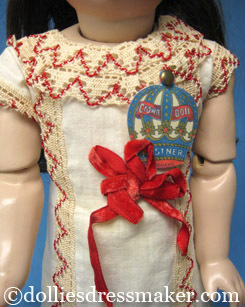 Secured to the chemise, along with a red velvet ribbon decoration, is a replica of the Kestner tag shown on the original photo. Vintage ivory and red trim, similar to the antique, was purchased from a collector of laces and trims and sewn to the chemise. Cindy added matching drawstring drawers with special scalloped tucks. After tucks are stitched mark every 3/8 inch along stitching line. 1) Run needle and thread through inside of tuck, coming out at first mark. 2) Put the needle under the tuck and come out at the same mark. Do this a second time. 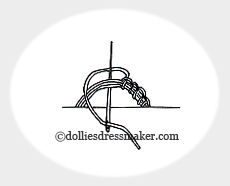 3) Run needle and thread through the tuck to the next mark. Repeat these three steps for the total length of the tuck. 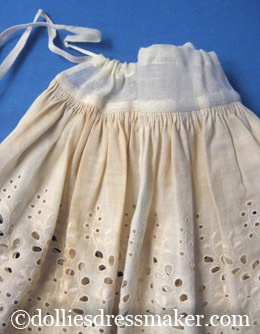 A white embroidered cotton eyelet petticoat with drawstring waist completes the underwear set. The dress is made from white embroidered cotton eyelet. Red ribbon is drawn through the beading which peeks out from beneath the apron skirt. 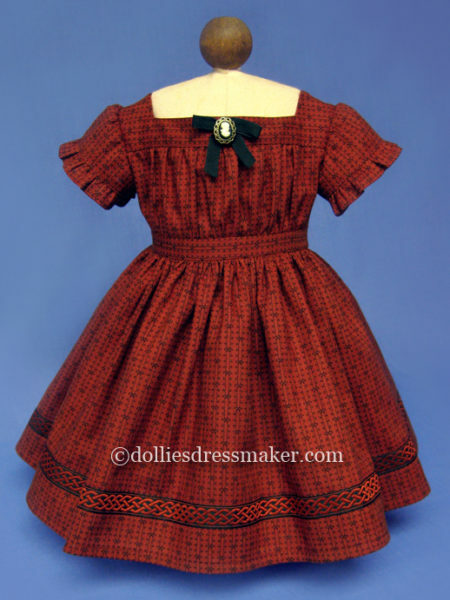 A gathered skirt falls from the empire waistline, and red ribbon bows occupy a spot at the top edge of the ruffle of the elbow-length puffed sleeves. An extra piece of white trim at the neckline serves as a standup collar. Buttons and loops secure the back opening. Method for loops same as for belt loops on apron. The bodice is lined, arm’s-eye seam is covered, and shoulder and underarm seams are French. The identifying feature of an apron is the complete back opening. Other than that, an apron could be elaborate or simple, have long sleeves or short, trimmed or plain. A belt or sash sometimes kept the apron in place. 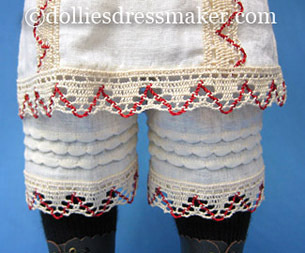 The red and white cotton dotted Swiss apron which Cindy replicated has a skirt that falls in gathers from the softly angled yoke. Also attached to the yoke is a ruffle which has been finely gathered with a pleater, producing very tiny pleats and giving extra detail. Short sleeves cap the elbow-length dress sleeves. The apron yoke is lined as was usual in 1890-1910 and seams are French. Two rows of lace tape are hand sewn as a trim around the yoke, ruffle, skirt, sleeves and belt. 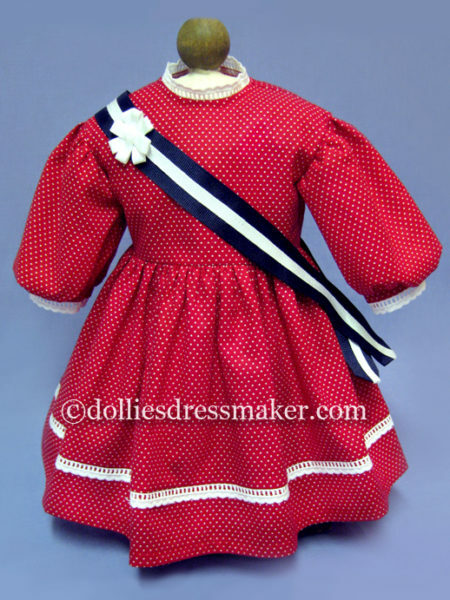 The hand embroidered belt controls the full fabric of apron, dress and petticoat, ending in a back bow, and is held in place by handmade thread belt loops. 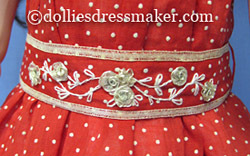 On the belt are small trim flowers sewn within a hand embroidered design. Black ribbed cotton thigh length stockings blend with the handmade boots that were so common to the period. The boots have black leather uppers and shiny pig skin lowers. Ties through four eyelets lace the boots over the leather tongue. Tops are scalloped and the lower section has white top stitching. 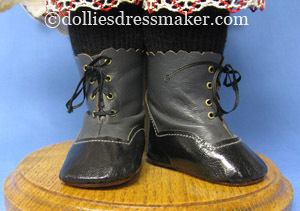 As she quite often does on her own doll costumes, Cindy incorporated a personal touch by using leather from an item owned by her grandparents for the shoe soles. In another costume she used felt from one of her dad’s hats to make the doll’s hat, adding her own history to that of her dolls’. 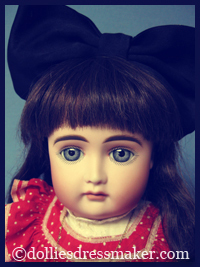 A spunky black silk hair bow contrasts with the double heart necklace which portrays the doll’s sweet, innocent side. The necklace began life as Cindy’s childhood ankle bracelet. 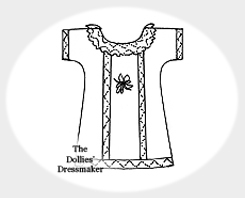 The article Dressing German Doesn’t Require Dressing Plain, by Donna Birkey was printed in the November 1996 issue of DOLL CRAFTER magazine (Volume 12 • Issue 7), published by Scott Advertising and Publishing Co., Livonia, Michigan. All photos in this article are courtesy of Donna Birkey.